Roasted Brussel Sprouts with Bacon merge the goodness of tender roasted Brussels sprouts along with the indulgence of crisp smoky bacon and loads of sweet garlic. 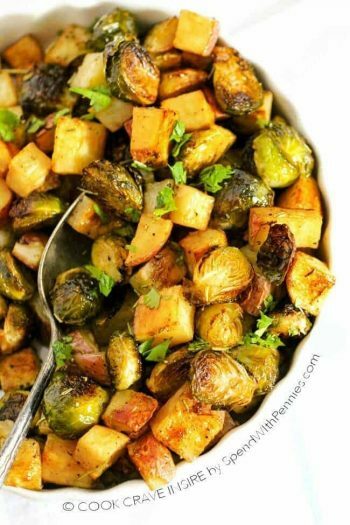 Brussels sprouts always make the top of my favorite veggie list! 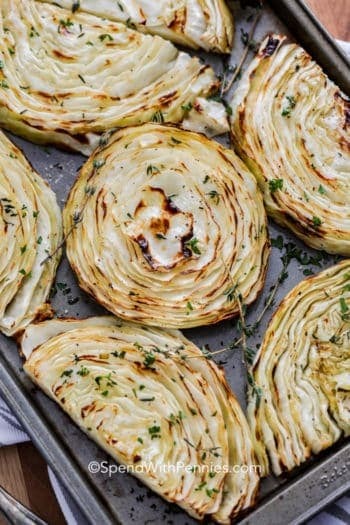 I love them baked, roasted, boiled and they’re even amazing raw in a Brussels Sprout Salad! 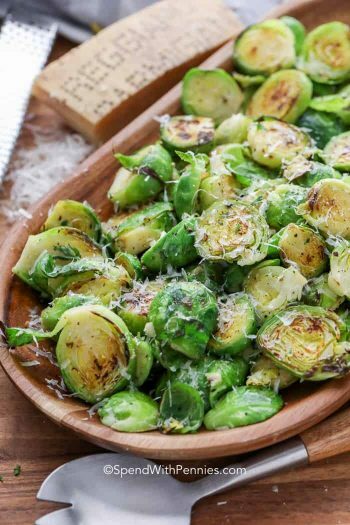 Growing up, Brussels sprouts were always served with butter and breadcrumbs and as much as we love them cooked that way, roasted Brussels sprouts with bacon take the flavors to a whole new level. Roasted Brussels sprouts are so easy to prepare; they are the perfect side to pretty much any meal (and even better with bacon). I know they’re going to become a staple side at your dinner table! 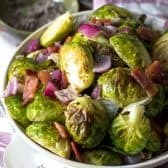 This roasted Brussels sprouts with bacon and garlic recipe actually comes from the newest addition to my beloved cookbook collection,The Simple Kitchen! This book is filled with recipes that aren’t fussy and are quick enough for weeknights. It was written by my friends Donna and Chad who blog over at The Slow Roasted Italian. The recipes use ingredients you likely have on hand already and they’re absolutely loaded with flavor. 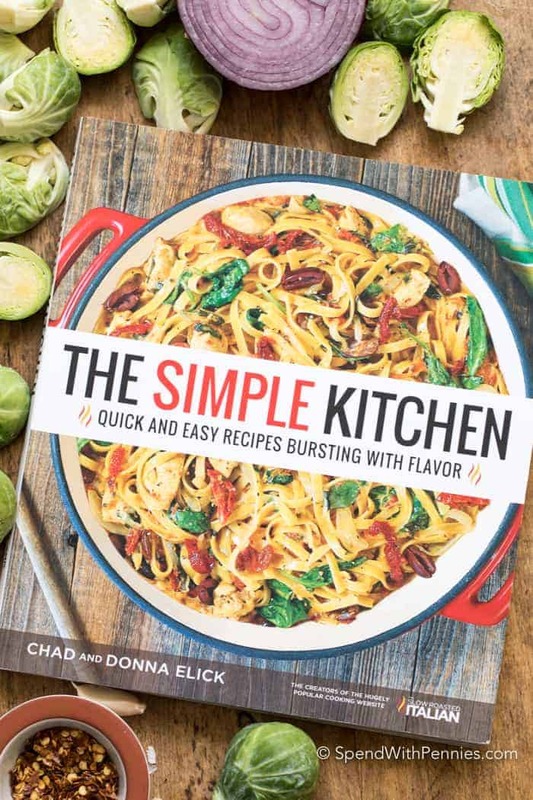 This book is definitely going to be a staple in my kitchen! While I had a hard time deciding, I knew this Brussels Sprouts and Bacon recipe (with loads of garlic) was going to be the first thing I made! If you’ve never made roasted Brussels sprouts before, you’re in for a real treat. Roasting vegetables at a high temperature causes them to caramelize, adding incredible flavor with very little work. Just simply toss with seasonings, onion, and garlic on a pan and add your bacon. 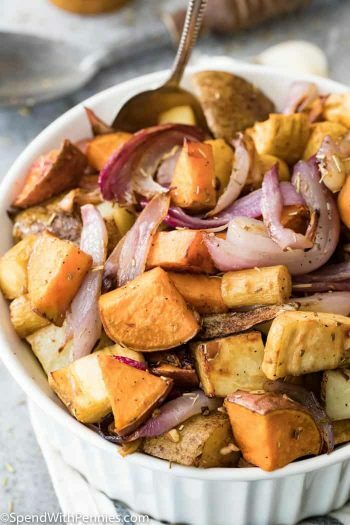 I sometimes just toss all of the ingredients into a bowl with a lid or a freezer bag and store in the fridge until ready to roast for an easy ONE pan dish! Roasted Brussel Sprouts can be made quickly and easily. 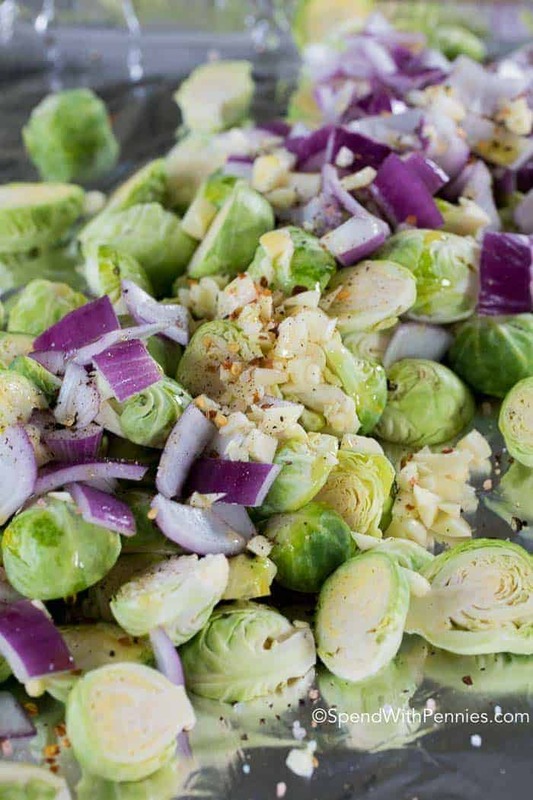 While this recipe adds bacon, onions and garlic, you can certainly roast brussels sprouts with very simple ingredients and get amazing results. Roast and enjoy. Truly so simple and so good! Wash and trim your brussels sprouts. Cut in half if they are large. Roast 25-30 minutes or until tender and caramelized. Can you Roast Frozen Brussel Sprouts? Yes you can but the results won’t be quite the same since frozen brussels sprouts are already softened. You’ll want to roast them from frozen about 40 minutes or so. I sometimes give them a quick broil to add some color at the end. 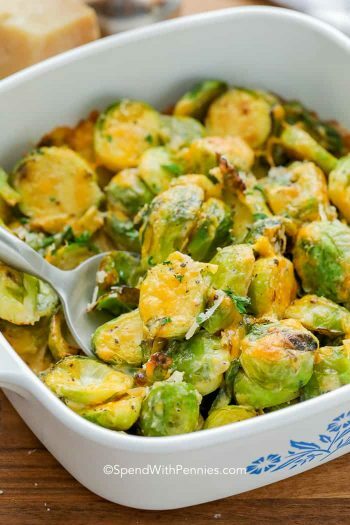 To make these Garlic Roasted Brussels Sprouts, follow the recipe below. 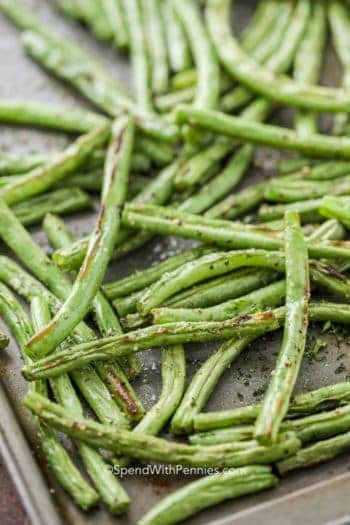 So simple, yet so incredibly delicious… this recipe, found in The Simple Kitchen cookbook will be one side dish your family requests time and again! 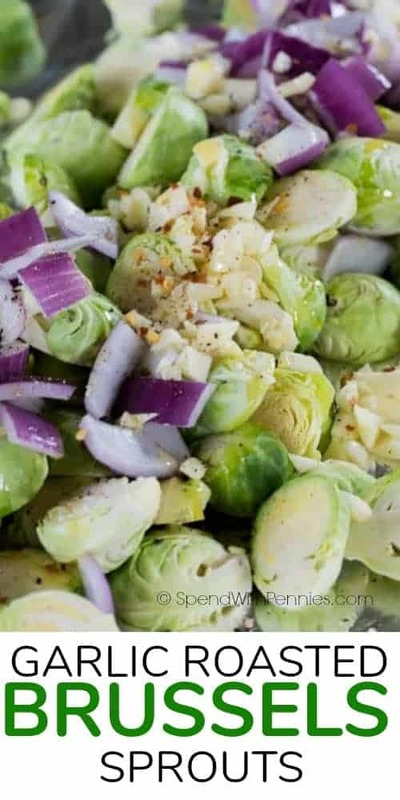 Brussel Sprout Salad – Favorite recipe! 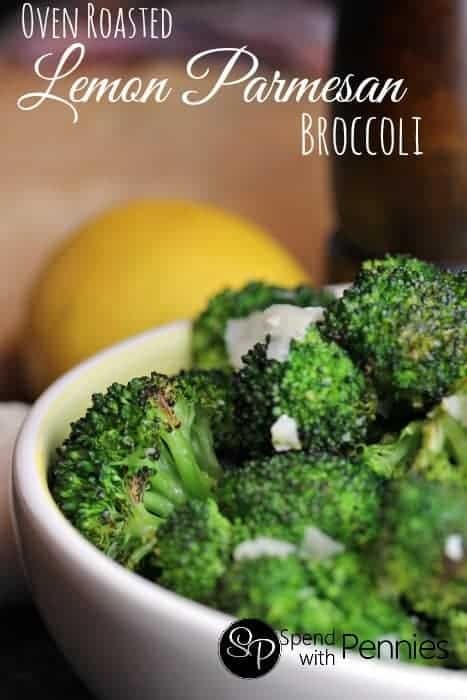 Oven Roasted Lemon Parmesan Broccoli – Just 10 minutes! Simple Roasted Beets – Easy, great as a side or to add to salads! 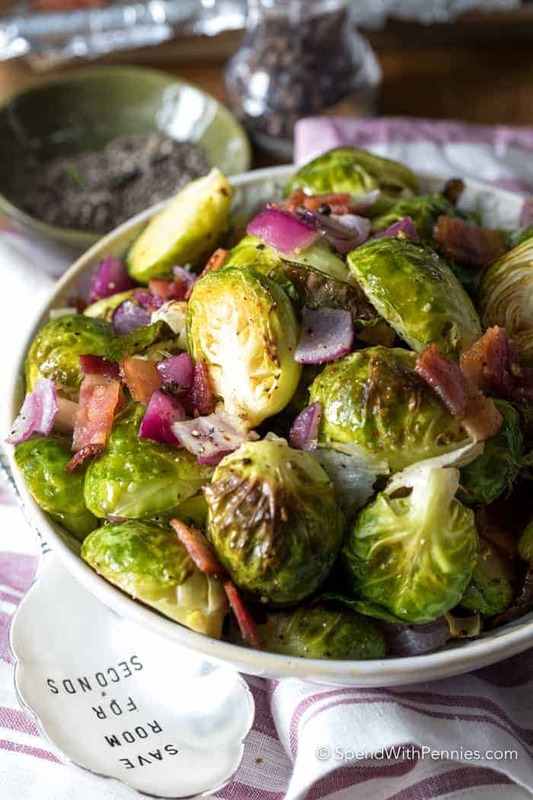 Tender Brussels sprouts, smoky crisp bacon and sweet garlic create an easy and delicious side dish your whole family will love! Preheat oven to 425 degrees F. Line a sheet pan with aluminum foil. Spread the Brussels sprouts, onions and garlic on the pan. 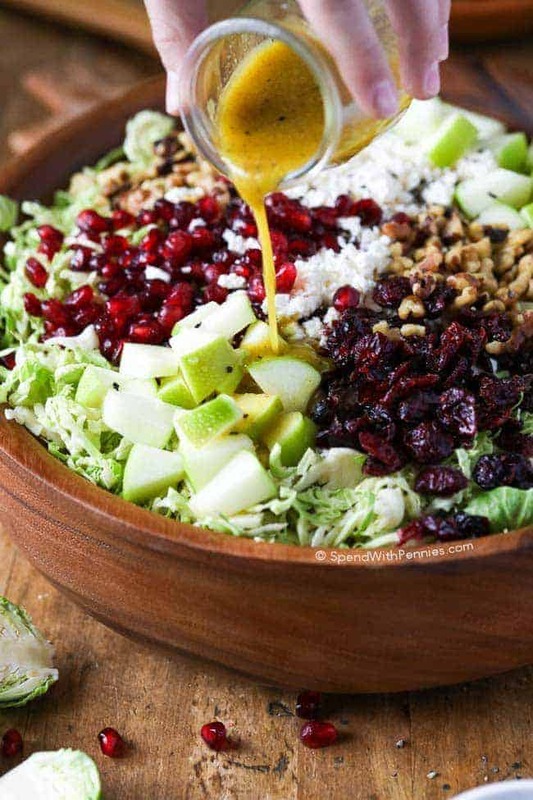 Sprinkle the sprouts with the salt, pepper and red pepper flakes, then drizzle with the olive oil. Toss the sprouts with clean hands until everything is well coated. Wiggle the pan until the Brussels sprouts are in a single layer. Sprinkle the cut bacon pieces over the pan evenly. Bake for 20 to 25 minutes, until the sprouts are fork-tender. Taste and season with additional salt if necessary.